I am not a biker. 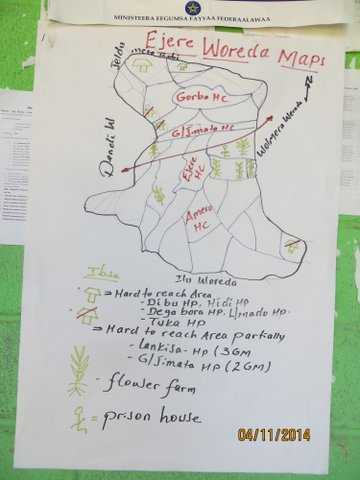 I am a retired GP from Bristol who is part of a small development project in rural Ethiopia, helping out with worthy aims such as wells, schools and health posts. So what am I doing writing an article for The Riders Digest? I will tell you. The villages often have no access by roads and are 15-20 kilometres from the nearest health centres where there is a midwife. They had no ambulances. What about motorcycles? They are in use locally, but could they be modified to carry a pregnant woman? We did our research, imagining different designs – a trolley pulled behind, a sidecar – and then I met a medical student who told me about eRangers. 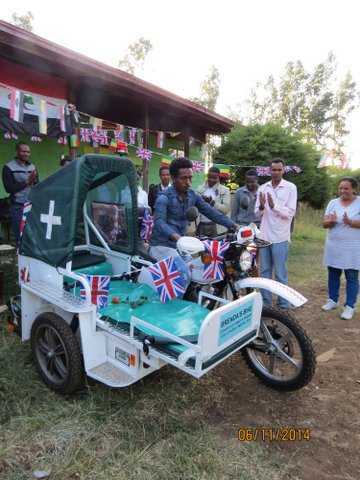 eRangers are “Motorcycle Ambulances“, a concept invented by an Englishman, Mike Norman. The motorcycles used are the Chinese-built Jialing JH125 and JH200. These are imported from China to South Africa, where they are modified at a factory in King Williams Town, Eastern Cape (the late Nelson Mandela was their patron for 13 years). The eRanger combines the benefits of a motorcycle with the cargo capacity of a sidecar, in a package that is cost-effective, rugged and simple to maintain. 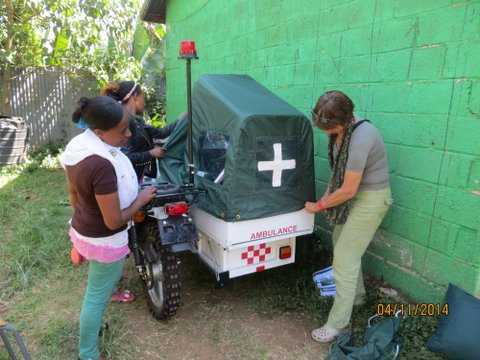 As it is able to safely and comfortably carry one patient and an outreach medical worker plus emergency supplies for on-site treatment, it can greatly reduce the time taken to get essential and urgent medical assistance to remote communities. Every ambulance has a purpose-built leading-link front suspension system fitted as standard, improving the ambulance’s already impressive off-road and on-road capability. In addition, complete patient protection is ensured with additional “roof” bars and an all-weather cover. 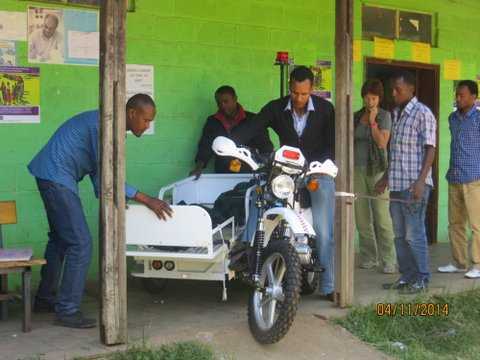 Patient transfer has been improved with a novel hinged section allowing easy access to the side-mounted stretcher, attached via metal-elastic mounts that, when combined with the sidecar’s suspension, considerably eases the ride over rough ground. The stretcher itself has multiple functions. When flat, a prone patient can be carried, protected by an all-weather cover. It then also converts into a suspended chair. In both positions there is storage space at the rear of the sidecar. The chair position is suitable for the walking wounded, sick and expectant mothers. 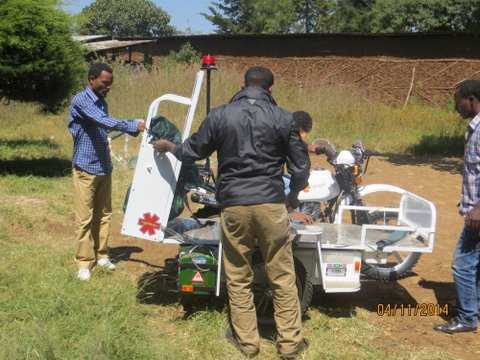 The Motorcycle Ambulance concept seemed like an ideal solution to our problems, so we decided to investigate the possibility of trying it out. 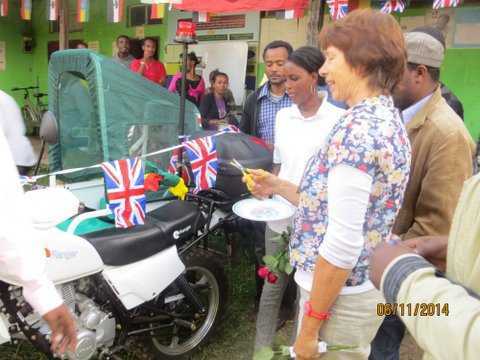 Gwent NHS health link were already using rangers’ ambulances for maternal health in Southern Ethiopia. 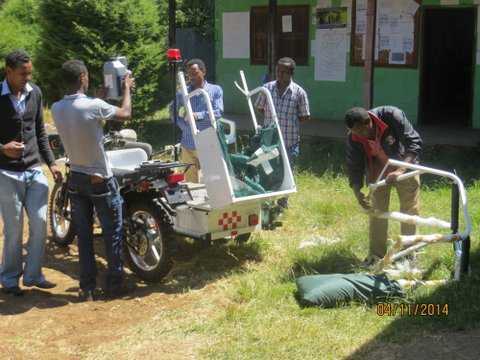 They had found them to be practical, so we decided to conduct a trial in our own area of Ejere Woreda which is in West Shewa, Oromia, Ethiopia – a rural area about 50km west of the capital, Addis Ababa. This was not as simple as one might think. Could we afford it? 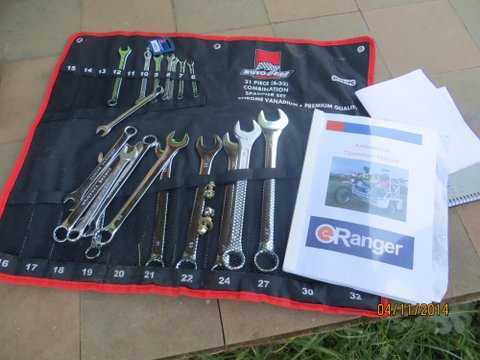 These vehicles are expensive -$6400 with another $800 for spares and another $800 for a tool kit. Our medical budget is not huge. I discussed this with my colleague, Dr Naomi Gillingham, who was enthusiastic about the project. She decided to make an appeal within her family and in memory of her late mother Brenda over Christmas 2013. This raised a substantial proportion of the cost. However the procurement process was not as simple as one might think. The process of discussing the purchase and ordering it was the simple bit; but how to import it? Ethiopia is landlocked. 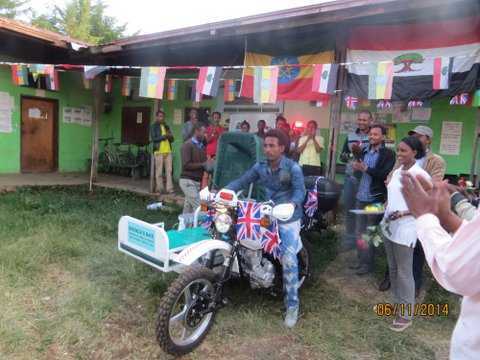 To bring the bike up from South Africa involved transporting it either by sea to Djibouti, and then bringing it overland to Addis Ababa, which would take around three months; or the alternative was to airfreight it in directly. Surprisingly, this was the cheaper and faster option, but the main stumbling block proved to be the Ethiopian authorities. As a gift from a charity, the bike should be exempt from import tax, but the stages to secure this exemption are labyrinthine. First, the project must be in the Charity’s written proposal, which has to be approved at every level of Ethiopian Health Planning. Once approved, all paperwork must comply with rigid specifications – one name mis-spelled, or in the wrong box, would necessitate a correction involving another round of visits from official to official for our co-ordinators in Ethiopia. Through no fault of theirs, the vehicle was left sitting at the airport incurring charges for days, but eventually, with help from eRangers, it was released. At the Health desk in Addis Alem there was enormous excitement. None of the staff wanted to go home, and when eventually at 10pm it finally arrived, a cheer went up. I arrived for the official handover a few days later. 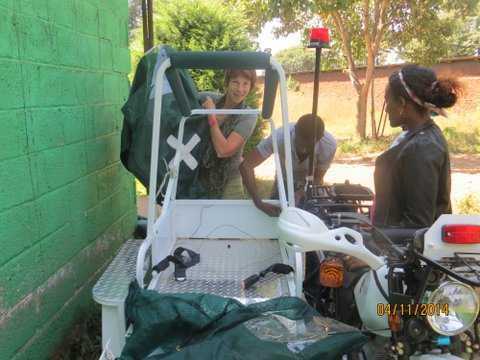 The bike was parked on the verandah of the Health Office, surrounded by fascinated health workers. It was wheeled out, and the side-car was assembled. 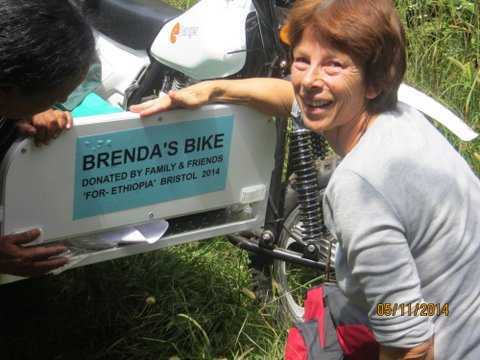 Next came the official handover of “Brenda‘s Bike“. 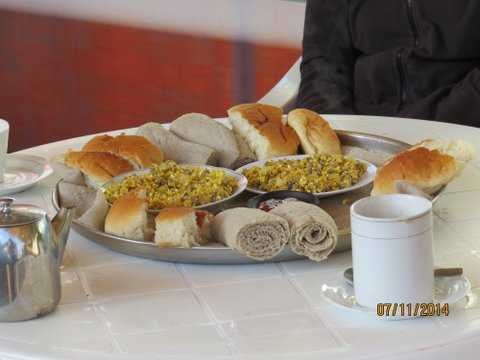 In Ethiopia, there are two main ingredients to a ceremony: many, many speeches, and a coffee ceremony! The health post was decked with bunting and flags, the charcoal was lit, beans were roasted and ground, the coffee was brewed and cup after cup of the strong, sweet brew circulated. There was even a bottle of fizzy white wine for a toast as they thought that was what we Europeans liked! And speeches: I will not name all the dignitaries that had to have their say, but each speech had to be translated into English, Amharic and the local language, Oromifa, and only then did we get to the feast. Darkness fell, and we repaired to a hall where injerra [Ed: a type of flatbread, and a national dish] had been prepared with many spicy dishes: wat (stews) lentils, popcorn washed down with tala (local homebrew beer) and soft drinks. Their delight with the new arrival was ecstatic. All these events only happened just a few months ago. Back in the UK, we still wait for news. Direct communication with the local Health Care Workers is always a problem as computers and email are not widely available, but I know the bike is being used. As yet I have no stories, but there will be many, and they will have to wait for a later issue. 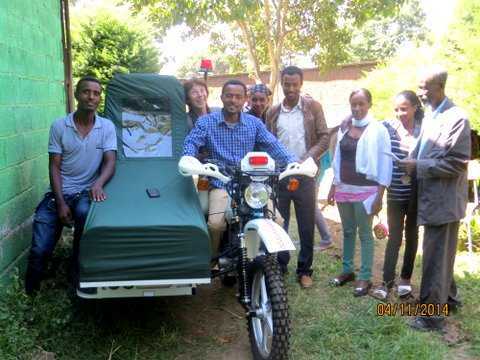 In the meantime, you can follow our progress on our website www.for-ethiopia.com and maybe even make a donation towards our next Motorcycle Ambulance! I like your humanity Brenda. But do you think Africa’s huge problems can be solved by charity? I fear for your bike – it will not be maintained and before long will be laid up forever. I hope I’m wrong. The bad situation is shown by the govt’s delays on the import of the bike. Tragic. No of course not Dave, we’re not naïve! but many fewer women and babies will die due to lack of health care assistance for complicated deliveries from eg sepsis, haemorrhage and obstructed labours. 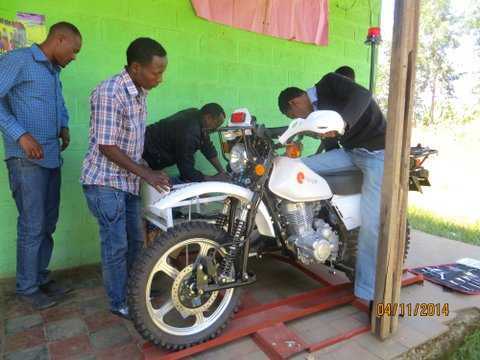 We are monitoring the bike’s effectiveness and providing training in maintenance and repairs. It was a mighty joyous hand-over.. l’m sad you’re so cynical. This is a shocking thing to be happening in Ethiopia in this day and age, with all the charity that is available. It brings happiness to me that there are good people out there though dedicating their time to helping these desperate women, their families and the isolated Ethiopian village communites that are stuggling every day.